Over the weekend, I encountered an article and a recording, both referencing community and player behavior in EVE Online. The article appeared last Thursday on Massively but I didn't see it until Saturday. The subject was how to deal with toxicity in MMO communities. "In the meantime, I’d like to see MMO studios work on prevention. Some games actively seek miscreants as their core constituency, and once your community has been tainted by or overrun by toxic players, it’s almost too late to salvage it." "A lot also depends on how a game’s community is moderated, just the same. EVE Online has a contentious and nasty environment not just because of the mechanics that encourage self-serving competition but also because the studio behind the game actively encourages players to be cutthroat and rewards members of the community who do so. The punishments given to offending players tell players what the designers want the game to be, so it falls on the side of the studio to determine what sort of environment they ultimately want to encourage." If anyone detects a note of "Grr Goons! ", I do too. The feeling flows both ways, and the Goon's disdain for Massively helped spark the creation of TheMittani.com. But I won't delve into old news as I am more interested in the topic of game communities. "Signal Cartel is a service corporation to all of New Eden. In this role, members are encouraged to treat all players with respect regardless of affiliation. In challenging situations, our goal is to look for a graceful resolution and set an example of dignity and friendship through our actions. "We embrace the attitude of a true explorer: we are friendly to others in our travels, neutral and never initiating aggression, and endeavoring at all times be perceived by the New Eden community as a non-threat. Although we never intentionally seek to harm, we may defend our friends and our ships. In suffering losses, we respond with good cheer and shed no tears. In this way, we aim to be recognized and respected by all across the cluster and left in peace to do our work. "Among our own ranks and with others, we are patient and generous with knowledge, ideas, and experiences. We foster a mentoring culture by answering questions, freely sharing experiences and learning resources, and when possible offering rookies one-on-one tutoring. "Specifically prohibited with your in-alliance character: Piracy, baiting, scamming, initiating PvP, and baiting or tricking others to lose assets. Member kill logs will be actively monitored and kills investigated." A very non-EVE statement, right? Or is it? EVE is all about accomplishing self-imposed goals, both at the individual and organizational level. The leadership of Signal Cartel believes that the behavior of its members, and not force of arms, is the optimal way to achieve those goals. The fact that such behavior often flies in the face of normal behavior in EVE makes any success that much sweeter. While the credo is a pretty radical position to take in New Eden, the idea of showing respect and kindness to others isn't as rare as people like Royce and Lefebvre believe. Of course, sometimes that respect is punctuated by explosions, but that is just a part of how the community works. Is consensual PvP permitted using the Duel mechanic? Is taking loot from SovNull or occupied wormholes an act of aggression and against the Credo? Is contesting a site considered aggression? Can I participate in Live Events? What about NPSI public roams? "Since 2009, EVE University has listed Aldrat as its official headquarters in New Eden. This was the latest in a history of different locations, ranging from 0.0 to Korsiki. It too will soon be part of our history. "On August 1st, 2015 EVE University will change its official headquarters to the Slays system, located near the market hub of Stacmon. This will involve moving of all University Services based at Aldrat, including, but not limited to services such as hangars, BYOM, and PYOS. "This will not be our forever home, but is merely another step to keep the University focused on what helps us meet the needs of our students. It is our hope that the new location will best serve the University moving forward, much as Aldrat was selected in 2009 as the best option at that time." Looking at Dotlan shows that Slays offers many advantages to Eve University. First, moving to Slays means Eve University does not need to maintain different campuses spread across New Eden in order to teach new players about content across the different security bands of the game. The system is conveniently located to NPC null, with two entrances to Syndicate located 4 jumps (MHC-R3) and 9 jumps (TXW-EI) away. Slays is also in the middle of a lot of low sec space and even serves as a high sec gate to the entirely low sec constellation of Mallugier. I don't know how much activity occurs in Mallugier, but new players might receive a lot of practice trying to tackle battleships owned by those with low security status attempting to transit the system. I mention the possibility because the Eve University leadership might want to use Mallugier as an area to get new players used to the idea of operating in low sec. The low sec constellation, while not having great asteroid belts, contains three systems with ice anomalies. Also, could we see the Uni put up a low sec POS in order to take advantage of some of the refining and manufacturing capabilities low sec POS have over high sec POS? Finally, Slays location offers one final benefit to the University: the distance to the major trade hubs. The nearest major trade hub is Dodixie, 10 jumps away. The major high sec wardec corps and alliances (and many of the minor ones) tend to stay near the high sec trade hubs, especially Jita and Amarr. With Stacmon next door, the Unista leadership is hoping that their membership won't even wander as far away as Dodixie, much less an additional 20 jumps to Amarr or Jita. Out of sight, out of mind. What the wardeccers don't see, they don't typically war dec. I know when I was in the Uni war decs were an annoyance and got in the way of some training. Then again, if the Uni starts teaching that a career as a low sec carebear is a viable playstyle, then maybe high sec war decs won't matter as much in the future. One of the questions concerning the new sovereignty system CCP released last week was whether small alliances could find a space of their own amongst the null sec powers. In at least one corner of the Dronelands, the answer is: yes. 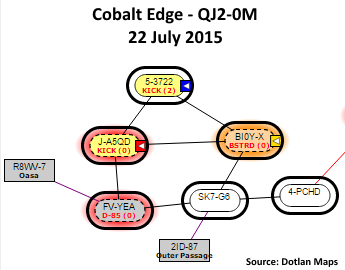 Shadow of xXDEATHXx, the largest rental alliance in EVE, completely owned the QJ2-0M constellation in Cobalt Edge up until mid-June, when Ministry of Inappropriate Footwork took control of 5-3722 on 17 June. The Russian alliance then lost control over the remainder of the systems over the course of a few hours on 16-17 July. SK7-G6 and 4-PCHD remain unclaimed, but five smaller alliances continue to hold onto at least one sovereignty structure in the remaining four systems. Perhaps the most defensible of the systems is 5-3722. The 251-member Ministry of Inappropriate Footwork [KICK] made the most of the 30 days head start on the introduction of the new sov system, grinding the system's Activity Defense Multiplier (ADM) up to 5.7. Of course, I imagine that KICK also declared 5-3722 its capital system, thus giving the ADM a bonus of +2. Such a high ADM means that in order to reinforce structures or capture control points, an attacker must apply an entosis link for 57 minutes uncontested, while KICK only needs to entosis a link for 10 minutes in order to conduct a successful defense. The system is rather poor in both moons (8) and asteroid belts (3), but does have the lowest true sec (-0.47) in the constellation. In addition to owning the Caldari station in the system, KICK owns both the territorial claim unit (TCU) and the infrastructure hub (iHUB). The second system that Dotlan shows KICK owning is J-A5QD. However, I think the map is a bit misleading. While KICK owns the TCU, no one owns an iHUB. In addition, the 171-pilot alliance Just A Game. [JAG.] controls the system's Minmatar outpost. Looking at the killmails in both 5-3722 and J-A5QD, JAG. and KICK are currently at war. Ministry of Inappropriate Footwork appears to have beaten of an entosis attack last night in 5-3722, but its TCU in J-A5QD is open to attack today. J-A5QD holds a lot more moons (44) and belts (13) than 5-3722 with almost the same true sec (-0.45). The system potentially could provide a nice home for a small alliance, especially one that makes the system its capital. The final system with a station in QJ2-0M is BI0Y-X. The system is a hotbed of PvP activity, with the TCU and iHub currently held by The Bastards. [BSTRD]. But just like J-A5QD, the Amarr station is controlled by JAG.. The 119-man long-time low sec pirate alliance is battling JAG. for control of the system, with The Bastards. losing control on 18 July and regaining it in the early hours today. While The Bastards. most likely have no use for the systems 10 belts except for ratting opportunities, the 46 moons may offer some good revenue someday. The last system containing a sovereignty structure is FV-YEA. In the system that leads to Oasa, the 685-member District-85 [D-85] owns a TCU. Honestly, I'm not sure if D-85 is serious about trying to hold sov or if someone just dropped the TCU for the lulz. Either way, the system lies in the direct path between Shadow of xXDEATHXx's holdings in Oasa and in the neighboring constellation of HNZF-Z. The system also lies in the direct path between Oasa and SOLAR FLEET-owned Outer Passage. I can't but help think that the near-term future of constellation QJ2-0M is that systems FV-YEA, SK7-G6, and 4-PCHD will serve as an unclaimed highway while Ministry of Inappropriate Footwork, Just A Game., and The Bastards. will fight for control of the other three systems. Ministry of Inappropriate Footwork appears secure in 5-3722, leaving the other two alliances to fight in J-A5QD and BI0Y-X to see who will remain in the constellation. Who knows. Perhaps the alliances will team up and use their three stations as a base to operate against the renters. But at least for now OJ2-0M is a place where some small alliances are trying to establish themselves in null security space during the first week of FozzieSov. Back when I attended university I learned that one of the biggest obstacles to mass transit in the United States was population density. Unlike Europe, the U.S. just doesn't have the population density in most of the country to make mass transit profitable, or even just break even. In EVE Online, I believe that residents of some sovereignty-holding alliances are about to learn that population density is not just a problem for urban planners in the United States. CCP designed the new sovereignty mechanics (a.k.a. FozzieSov) to encourage alliances to live in the space they claim. And by live, I mean ratting and mining in order to increase the defensive modifiers, not just flying through looking for interlopers. Two weeks ago, CCP Fozzie summarized all of the changes to PvE designed to make null sec more livable, including changes designed to allow for an increase in the population density of systems. The more pilots flying in space, the easier an alliance can flash form a defense fleet to drive off nuisance raids. Also, the easier an alliance can raise the defense indexes. The above graphic from Dotlan shows that most of the large alliances chose not to consolidate their holdings before the implementation of the new sovereignty system. Except for the two Imperium coalition alliances Goonswarm Federation (135.9 pilots/system) and Fidelas Constans (61.8 pilots/system), the rest of the top sov holders have a population density of under 20 pilots/system. In fact, Red Alliance (9.0 pilots/system) and the renter alliance Shadow of xXDEATHXx (8.7 pilots/system) both have a population density of under 10. Is the population density of the Russian alliances on the list enough? The Goons evidently don't think so, as they announced a new rental program this weekend. The largest alliance with the highest population density is attempting to increase its population density and PvE activity even further. In the meantime, the two largest sovereignty holders are still rental alliances. Are the Russians not concerned because they struck a deal not to attack each other's renters? Despite the spin coming from certain quarters, I don't think anyone really knows how the next six months will play out. 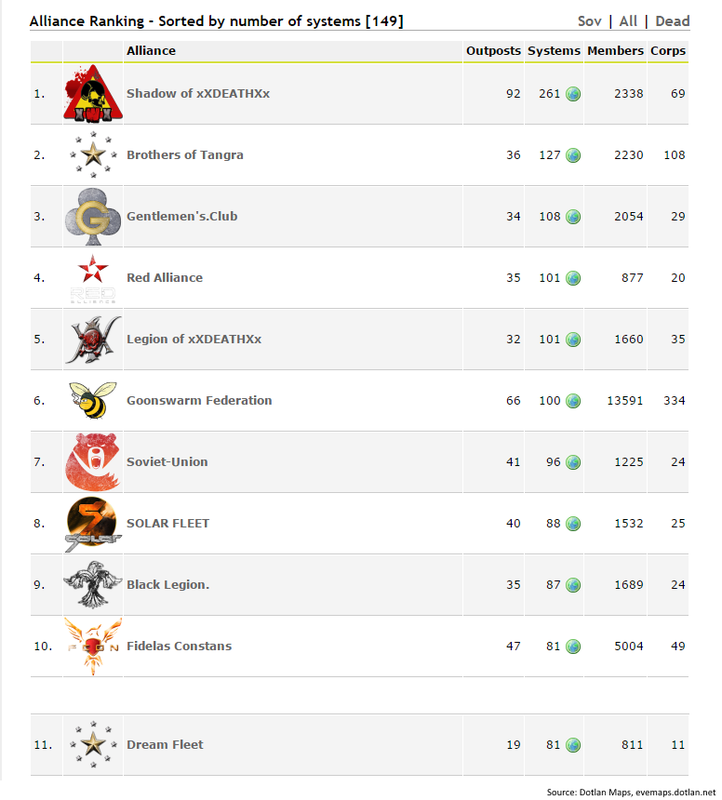 The Imperium, especially Goonswarm Federation, is well positioned, however. If their leadership is correct, then a lot of space will changes hands over the next few months as the Russians pay for overextending themselves. And if The Mittani and crew are wrong? Well, then they will sweep out of the galactic north-west and cause havoc. I hear they miss Delve and want to go back anyway. With the capture mechanics of FozzieSov ready to launch tomorrow, I think EVE is about to experience an increase in activity similar to that experienced with the launch of Crucible in November 2011. 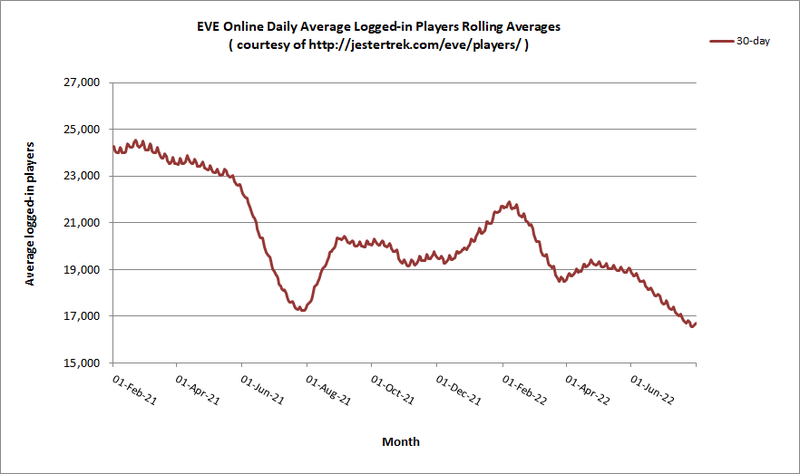 Crucible was the expansion that followed the Summer of Rage and saw EVE's activity numbers rebound for two years. The first requirement is a drastic decline in activity. As I wrote last week, Ripard Teg documented such a decline on Reddit. Below is one of Ripard's graphs covering average concurrent users from January 2014 to June 2015. Pretty drastic, right? One might even ask if EVE is dying. But one cannot go just by the concurrent user numbers alone. As is my habit, I dove into the real money trading numbers, both the black market figures and the sales of PLEX in the game for ISK. While my latest research on ISK buyers is still ongoing, I think the sales figures from The Forge might interest some folks. Pretty amazing, isn't it? According to Ripard's graph, the average concurrent users logged in during March 2014 was about 35% greater than last month, yet players in both month's used PLEX to purchase 61 trillion ISK. 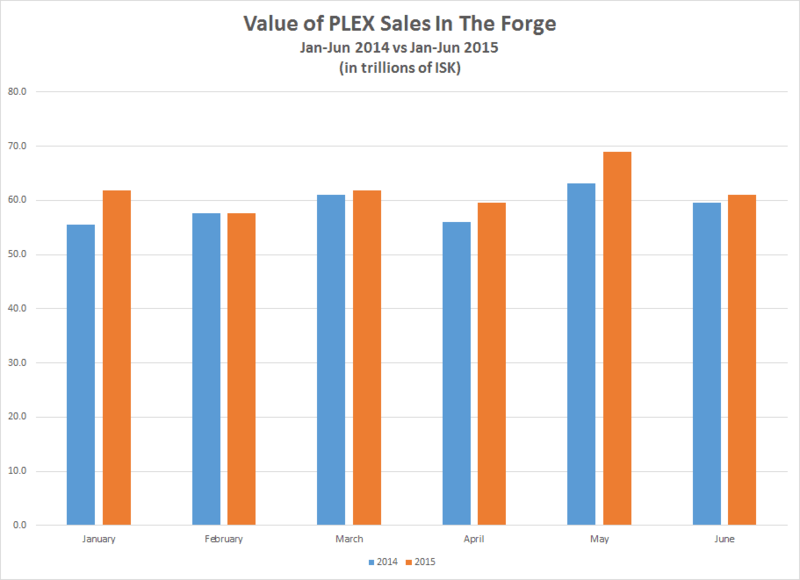 In the year-over-year comparison I did for the first half of 2014 vs 2015, players purchased as much if not more ISK every month in The Forge, home of EVE Online's premier trade hub, Jita. If EVE were hemorrhaging players, I would expect the amount of ISK players purchase every month to decrease. I just don't see that happening. What I believe is occurring is that players are not multi-boxing as much as they used to. CCP has made changes to the game over the past year to reduce the amount of accounts players need. Does that hurt the bottom line until the cash shop comes fully online? Definitely. I even expect CCP will take a financial hit as the company moves away from the cult of multiple accounts. I should add that I probably have a longer time frame in mind for judging the success of CCP Seagull's efforts in guiding EVE Online into the future. The effort to redo all of the major systems in addition to altering the business model to rely less on subscriptions and try to keep the existing player base happy is similar to trying to modify a race car going 200 miles per hour. Despite the delays in instituting the null sec sovereignty changes that helped create the latest drop in activity, I like what CCP Seagull accomplished in her first year as executive producer of EVE Online. Back in November I wrote that I wouldn't give CCP Seagull's tenure as executive producer a final grade until June 2017. I figure she needs that long to fully implement her vision. But for now, the next step in the plan lands on Tranquility tomorrow. Thank whatever deity you worship, because now the pundit class (including yours truly) can stop speculating and start observing. One final set of changes that we are implementing in Aegis is a set of tweaks to Nullsec wormhole spawning and Quantum Flux Generator upgrades. Some members of the CSM (I’ll let them identify themselves if they wish) approached us in recent weeks with balance concerns about wormhole travel for Nullsec entities. We took a look at their concerns and decided to make some tweaks to help ease them. The changes we are making are not intended to kill strategic wormhole travel. We believe that wormhole travel provides an exciting and somewhat unpredictable way to roam across long distances. We are beginning with a set of tweaks to Nullsec wormhole connections in Aegis, intended to ease some of the concerns around WH power projection without negatively impacting wormhole residents or eliminating the ability of Nullsec entities to roam through wormholes. A significant decrease in the spawn rate of direct Nullsec to Nullsec wormhole connections (which are not the primary method of WH roaming travel but are some of the hardest connections to counter with defensive play). Small decreases in the spawn rate of random Null -> C5 and C5 -> Null connections. This change does not affect static connections. A decrease in the lifetime of Nullsec WH connections to 16 hours (most were previously 24 hours). We are also making some slight tweaks to the Quantum Flux Generator system upgrade in our July 14th release. These are intended as a slight buff to anyone who uses Quantum Flux Generators for PVE daytripping, while also addressing concerns expressed by some CSM members. With these changes we still don’t expect that most alliances will find the Quantum Flux Generators to be extremely valuable, but hopefully their PVE value should increase somewhat. The drama surrounds who on CSM pushed for the changes. Sort Dragon is pointing the finger at Manfred Sideous. Manny says he just tried to minimize the damage Sort tried to do. Pandemic Legion may decide that DARKNESS., Sort's alliance, doesn't deserve any of their space in Querious. Something tells me Providence is not the only region that will begin to burn on Tuesday. In the meantime, I foresee a lot more traffic going through Thera. Did I mention that a group maintains a web site that shows all the wormholes going in and out of Thera? If you choose to use the service, please don't forget to leave a tip. Are people really saying EVE is dying based on the concurrency numbers over the past couple of months? I guess that is only appropriate with EVE Is Dying Day fast approaching, but I think reports of the game's impending death are greatly exaggerated. Ripard Teg put together several handy little graph consisting of the average concurrent users in EVE in 2015 and posted a link to them to Reddit. I posted one covering the last 18 months below. When I look at the graph, I think of two things. First, that null sec is stagnant and a lot of players are waiting on the implementation of the new null sec sovereignty mechanics next Tuesday. I'll go one step further and state that the delays in implementing the new system aided in the decline in the average concurrent user numbers. At the beginning of March, CCP announced that the sov system would appear on Tranquility in the June release, or 2 June. But on 7 May, a dev blog announced that the actual capture mechanics were delayed until 7 July. Shortly after that date, the graph started to edge down. The trickle grew into the beginnings of a failure cascade on 1 June when CCP announced another week's delay, until 14 July. With the null sec powers playing a waiting game, one group became null sec's punching bag: Brave Newbies and HERO Coalition. I don't know what BNI's participation rate was at the end of the fighting in Fountain, but I hear the numbers were poor. I wonder how much of the recent decline was a result of members of Brave just refusing to log in and engage in another fight they probably could not win. I could go into an analysis of why a drop in activity is normal for a 13-year-old game. But FozzieSov is dropping in 6 days. Perhaps CCP will amaze and confound conventional wisdom one last time. "It is great news to get a defined policy to follow and very much welcomed by vloggers and streamers." "Videos and streams may also not be used to generate real world revenue by offering in-game ISK and/or assets as incentives to subscribe to a paid service such as a Twitch channel subscription or other subscription service. "If in-game assets are used in giveaways to promote popularity of a stream or video, there must be full parity between users who are viewing the content for free and those who are subscribed, and all viewers of content must have the same access to giveaways and the same chance to win prizes regardless of any subscription fees paid. "Use of in-game assets for subscription-only based prize draws and incentives constitute real money trading (RMT). This is against our policies." So I get to address the issue. I think the two streamers most people pointed to who violated the new policy were TheMittani.com and 1ronBank. First, let's look at the easiest case to understand, TMC. TMC had two practices that violated the new policy. First, they performed subscriber-only giveaways using in-game items. Secondly, they also weighted the odds towards subscribers in giveaways in which both subscribers and non-subscribers participated. Two practices that The Mittani stated TMC would cease on 27 June on The Meta Show. CCP Falcon appeared on the broadcast and explained the policy near the beginning of the show. The second Twitch stream in question is 1ronBank. I watched the 3 July stream and, despite the quote at the beginning of this post, he claimed he didn't understand what he could and could not do. He also stated he attempted to contact CCP several times with questions and never received a response. Not a good start. 1ronBank did make changes in order to comply with the revised policy. Both subscribers and non-subscribers can only win in-game items once per stream. For his infinite raffles in which people may purchase as many tickets as they want with iron, 1ronBank's virtual currency, he will only offer out-of-game prizes. Yes, PLEX codes purchased from a reseller are out-of-game prizes. Despite the changes, I do not believe 1ronBank is in full compliance with CCP's policy. In order to enter a raffle, people must still purchase tickets with iron. Subscribers earn iron at 4 times the rate as non-subscribers. As long as the iron is given out at uneven rates, I believe that 1ronBank is in non-compliance and faces CCP reporting him to Twitch for violating CCP's proprietary rights to EVE Online. Quite frankly, my big concern isn't whether CCP decides to ban 1ronBank. My concern is that 1ronBank's actions could get one or more of his viewers permanently banned from EVE. In addition to a affiliate link to authorized PLEX reseller Markee Dragon, 1ronBank is also a partner of G2A, an unauthorized reseller of PLEX. G2A doesn't have the best reputation and earlier this year found itself involved in the scandal in which EA's Origin website sold thousands of Ubisoft game keys to people using stolen credit cards. Polygon reported that sellers on G2A sold around 2000 of the fraudulently acquired game keys. One of the better known facts about game publishers is that they hate credit card fraud with a passion. CCP is no exception. If a player redeems a PLEX purchased from an unauthorized PLEX reseller, and that reseller obtained the PLEX code through credit card fraud, the player can expect CCP to ban the player and all the player's accounts. Permanently. Purchasing game time codes from an authorized PLEX reseller is means players don't need to worry about getting banned. Did I mention that 1ronBank intends to give PLEX codes as the prizes for his infinite raffles? Hopefully he buys the codes from someone like Markee Dragon instead of G2A. I'd hate to see players banned from EVE because they trusted the wrong person. Hopefully, this is the last post I write concerning violations of CCP's policies by Twitch streamers. I have my doubts, but maybe people will act responsibly for a change. I know some people will, but for some reason people will try to push the boundaries and wind up getting burned. I don't really understand the excitement about Star Citizen. Then again, I am not the target audience. I don't like flight simulations. 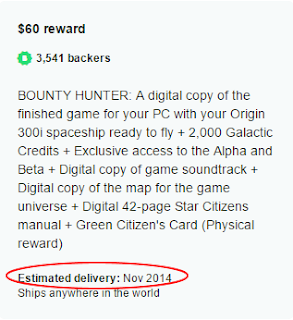 Before the Star Citizen Kickstarter project launched in October 2012, I'd never even heard of Chris Roberts or Wing Commander. In fact, the only reason Star Citizen even showed up on my radar screen was the grey market activity that seemed to fuel the game's extraordinary fund raising. I don't use the word "black market" because I believe the game company officially frowns on the RMT activity but won't crack down on anyone participating. Unlike many, I don't think Star Citizen is vaporware that will never see the light of day. Sure, if the delivery dates on the Kickstarter page are any indication, Roberts told backers that the game would see a full release in November 2014. In a BAFTA Masterclass presentation in January, Roberts gave a timeline for the release of Star Citizen with a release of the FPS and Planetside/Social betas in the spring of 2015, the release of Arena Commander 2.0 multi-crew ships this summer, backers receiving alpha access to the persistent universe by the end of 2015, and the commercial launch occurring sometime in 2016. Personally, I think that timeline is still too aggressive. I expect the full commercial release to occur in Q4 2017 or Q1 2018. A new company needing 5 years and $150 million to develop a game as ambitious as Star Citizen seems realistic. If I were a cynic, I would suggest that Roberts gave out overly optimistic target dates in an effort to keep the money rolling in. What really caught my attention about Star Citizen yesterday was Roberts' plan to sell in-game currency for real world cash. The game's business model is buy-to-play like Guild Wars 2, but with the option to buy United Earth Credits, in-game currency, in the cash shop. The exchange rate currently is $1 for 1000 UEC. Interestingly enough, the design team plans to combat inflation by instituting currency controls. Players can only acquire 25,000 UEC in a 24-hour period, with a player only having the ability to hold 150,000 UEC at any one time. I wonder what a 25,000 UEC daily limit will mean for players into manufacturing and playing the market. Will this limit the amount players can sell and how much they can charge? Or is earning UEC in-game such a grind that industrialists can sell multiple items without worrying about the game's artificial caps? Given the studio's history of chasing after the money with ship sales, I wonder if the selling of in-game currency will lead to a situation like the hyperinflation that occurred in Gaia Online. New management of Gaia Interactive came in and demonstrated it preferred chasing short term profits over the health of the virtual economy. I don't have a lot of faith that Roberts would not make the same decision. But hey, if the makers of Star Citizen want to allow more real money transactions that the typical game, that's their choice. As I said at the top of the post, I don't play flight simulators, so I don't really care what happens to the game. But if I'm still blogging when the game launches, I will take some time to watch the economy. I find RMT fascinating and I wonder how these rookies will handle the issue. Going from unemployment to trying to adapting to a new company and learning its proprietary software as fast as possible is a bit of a shock. A pleasant shock, but still a shock. One thing I'm taking away from the first few days is I really need to get my personal time in order. If I don't, I won't even play games when I get home from work. I'll just come home, surf the net for a couple of hours, then go to sleep. I do have another research project. Matterall in his EN24 article on real money trading used titans and supercarriers as examples of items players will purchase with dirty ISK because the amounts involved are so large. Over the past two years I noticed that the amounts purchased at one time are growing ever so larger. Has CCP succeeded in getting the more casual player with more modest ISK needs to eschew the black market and buy PLEX? Something to try to find out. But my illicit RMT projects usually take a minimum of 30 days to bear fruit in the form of blog posts. I need to come up with other ideas. Which brings up the whole idea of organizing my time. I need to come up with a list of ideas of blog post subjects. I don't lack for ideas. The problem comes when I sit down at the computer and try to remember them. The big ideas that require a weekend to write I remember with no problem. But I don't have as much time anymore, even compared to the last couple of years at my previous job. So I'm back to making lists. Lists for things that catch my interest while surfing the net. Lists of things to do when I play. Possibly even lists of what lists I need. I see a profusion of lists in my future. Hopefully I will get everything straightened out over the holiday weekend. I know I'll get to play some games at the minimum. Now I just need to come up with a good topic for my next post.